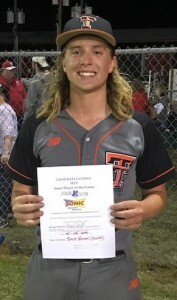 The Sonic Drive-In Player-of-the-Game for Thursday, April 4, is Trent Becker of the Trenton baseball team. Becker set the tone early as the Tigers defeated Williston on the road, 7-0, in a match-up of top 10 teams in Class 1A. The junior pitcher did not allow a baserunner until the fourth inning on a walk and he didn’t allow a hit until the fifth inning. Becker (4-1), who entered the game with a 0.91 ERA, only allowed the one hit in five innings of action. He walked two and struck out six. He was also 2-for-3 at the plate. Trenton (11-3), ranked 9th in 1A, would get all the runs it would need in the first inning. Senior Zach Hardee led off the game with a single, stole second, and scored on a throwing error after senior Blake Hall reached on an infield hit. The throw by shortstop Ethan Davis was wild, allowing Hardee to score and Hall to go to third. University of Florida commit Wyatt Langford followed with an RBI double to score Hall for a 2-0 lead. Langford went to third on a fielder’s choice by sophomore Jacob Guthrie, but another error at short allowed Langford to score on a throw to first. Trenton, which scored four runs in the first and added single runs in the 4th, 5th & 7th innings, will host Bell for a 1A-District 7 game on Friday night at 7 p.m. Williston (8-5), which committed six errors, will travel to Hilliard for a 1A-District 6 game on Friday night at 6 p.m.